Vintage curtains, accompanied by pink/white stripe accents, come together in a fun dress, size K-1st Grade (5-6 years), measuring 24” at the waist, 23” length. 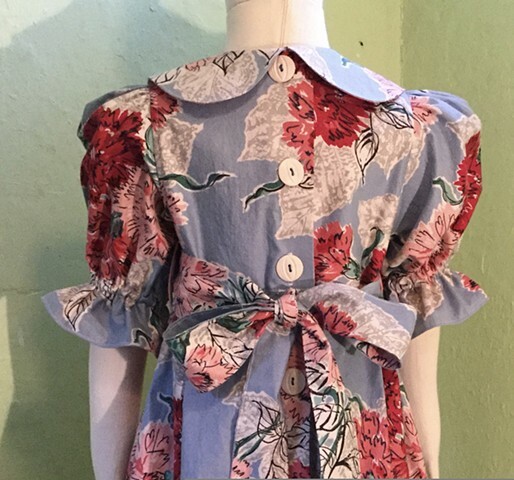 Petal-shaped collar, puff sleeves with elasticized ruffle, full pleated skirt, 2 rick-rack trimmed slanted and lined pockets, buttons all the way down the back with special white antique buttons, belt encircles waist and ties in the back. $90, 100% cotton, washable, made by the designer herself and shipped free to any address in the U.S.